We offer many lycra products for ponies including hoods. Some people call them sleazies or slinkys but they're most commonly called hoods. They're very stretchy and keep their manes tidy and will also keep braids looking neat and fresh. Because lycra can stretch and rip easily, it's not recommended to turn animals out with lycra hoods in place. Many people use lycra shoulder guards to prevent rubs from blankets and sheets. There are also full lycra sheets and lycra tail bags. 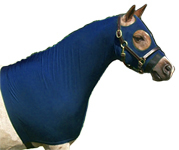 There are even lycra sheets with hoods for your model horse! They fit the traditional Breyer size models. The same lycra material is used to make helmet covers and these come in a wide range of colors and designs.